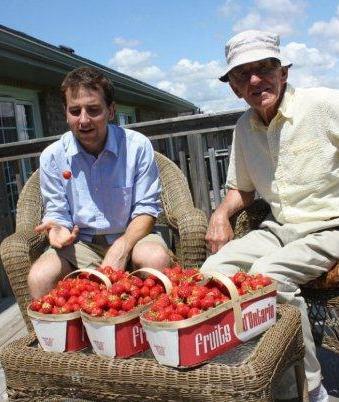 The local strawberries are ready for picking almost everywhere in Canada. There are so many good things to make with them, but if you want to really enjoy the amazing strawberry flavour, here is what my grand-mother used to do almost every Sunday for lunch in Summer. Most French people have a Sunday lunch gourmet meal that goes from noon to 4 pm, and they often skip dinner as a consequence. Sunday morning early, pick strawberries from your garden or make a quick visit to the farm or the market. This is essential so that you do not have to wash the strawberries, any sand or soil can be brushed off gently. My grand-mother always delegated this job to a grand-kid. The next phase was also delegated to a happy little kid who was entrusted with a sharp Opinel knife to remove the green and slice the strawberries in half or even quarters for the really big ones. The strawberries are put gently in a wide serving bowl, sprinkled with one tbsp white sugar and the juice of half a lemon and given a very gentle stir. They are ready to eat by the time Dessert time has arrived. Never put them in the fridge! If you need something looking more grand for dessert, put the above mix in glasses or cups and add a large spoon of Balkan yogurt, plain, coconut or lemon flavor. Decorate with a sprig of fresh mint. Optional: Add one tbsp of Kirsch or white rum when you add the lemon juice! This entry was posted in Dessert and tagged cooking, food, local strawberries, opinel, recipe, recipes, strawberries, yogurt. Bookmark the permalink.